Mergulhe na beleza distinta da Provence com uma excursão de um dia saindo de Avignon! Com o seu pequeno grupo, veja as elegantes mansões e a arte local em Aix-en-Provence antes de ir para a cidade de Moustiers Ste-Marie, no lado dos penhascos, para apreciar vistas de tirar o fôlego e ler atentamente as cerâmicas. Termine com uma visita a Sainte-Croix du Verdon e os picos de calcário de Verdon Gorge, onde você pode relaxar com um passeio à beira do lago e um mergulho refrescante. Sua excursão Provence de um pequeno grupo de um dia inteiro começa com a coleta matinal do seu hotel em Avignon. Encontre seu guia e embarque na minivan para um curto passeio até Aix-en-Provence, uma cidade universitária chique com uma vibe boêmia distinta. Ao sair de Avignon, admire a rara beleza do sol que se eleva sobre as colinas de lavanda. Desembarque em Aix-en-Provence para um breve passeio a pé. Tire fotos memoráveis de mansões dos séculos XVII e XVIII, fachadas interessantes e passarelas arborizadas. Vá até uma padaria local para experimentar um calisson, um doce francês feito de frutas cristalizadas e amêndoas, e aproveite o tempo livre para explorar o vibrante mercado ao ar livre da cidade. Em seguida, siga para Moustiers Ste-Marie, uma vila medieval situada em um desfiladeiro de calcário. Absorva o sol e os aromas de lavanda enquanto percorre a cidade e lê as cerâmicas tradicionais pelas quais a cidade é conhecida. Entre em uma oficina para obter uma visão única da produção e técnica de cerâmica de um artista local. Sua parada final é o Verdon Gorge e a vila de Sainte-Croix du Verdon. Aqui, desfrute de vistas magníficas dos imponentes penhascos de calcário e descubra a ciência por trás do inacreditável matiz turquesa do rio. Leve o seu tempo vagando pela encantadora cidade, nadando e descansando na praia de areia dourada. Seu passeio de 9 horas termina com o desembarque noturno em seu hotel em Avignon. Despite the rainy weather, my daughter and I very much enjoyed our unexpectedly-private day trip around Provence! Our guide Jeremy picked us up right on time at our hotel, where we were surprised to learn that it would be just the two of us taking the tour. Our first stop was Aix-en-Provence, where Jeremy led us on an interesting and enlightening 20-minute walking tour past some major sights in the town before leaving us with a map and 45 minutes to explore on our own. We enjoyed the sights and smells of the Thursday markets and even picked up some items for a picnic lunch to enjoy later in the day. After Aix, we drove to Moustiers Sainte-Marie, where we had an hour and 15 minutes on our own to explore the hillside village built across a waterfall. Though the weather did not cooperate and it started raining harder, it did not dampen our spirits. Moustiers was still truly breathtaking! We were slightly delayed in Moustiers due to our van getting stuck in the muddy parking lot below the town. While we waited for the van to be towed, Jeremy escorted us on foot a short walk downhill, to our next stop, a nearby ceramics factory. Jeremy gave us an informative tour of the factory, then we had some time to buy souvenirs in the adjacent shop. 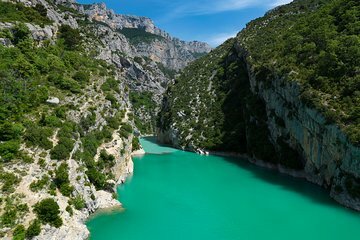 With our van successfully rescued from the mud, we drove on to our next stop, the Gorge du Verdon. We briefly stopped at a bridge between the lake and the gorge to take in the scenery before continuing on to Sainte-Croix-du-Verdon and its lakeside beach. We had an hour there on our own either to explore the town or meander down to the beach. The town and beach were unfortunately deserted due to the rain, but it was still a nice place to see. After Sainte-Croix, we drove 2 and half hours back to our hotel in Avignon. All of the places we visited on this tour were spectacular, and we had just enough time to get a flavor of each place before moving on to the next. We recommend this tour to anyone who enjoys exploring beautiful places! Very good! Great sights, enjoyed it all the way! We saw beautiful places on this trip and our guide Jeremy was really good. There were only 3 customers, so almost like a private tour. First we spent an hour in Aix-en-Provence. We walked to the calisson place and then had free time. The city was nice, but an hour was not much. There was a market, but at least the area where they sold clothes and bags etc wasn't very interesting. Most stalls sold the same stuff, that looked like it was brought from China. Next was Moustiers Ste-Marie, about an hour there too. The village was very beautiful! There's some old place and a good view higher on the mountain. I had lunch here so I didn't have time to climb up, but another person on the trip did and recommended it. You have more time to look around if you bring your own food or just grab something quick. Otherwise you have to eat here or in Aix. Next stop was a ceramics workshop. It was interesting, but it took an hour which was too long. We drove up higher and stopped to take photos above the lake, the view was beautiful. The canyon we only saw briefly from the car, before we turned back to drive down to the lake. We stopped at a place where the canyon starts and then drove to Sainte-Croix. We had about 30 min by the lake. None of us had swimming suits with us, but there wouldn't have been much time for swimming anyway. On our way back we stopped by a lavender field, but they were not fully in bloom yet early June. The overview page says that the trip is 9 hours and the info page says 11. For us it was a bit over 10 hours. I really enjoyed the trip, but I would've changed a few things. I booked it because I wanted to see the river canyon, but we didn't see it very much. I would have liked a possibility to rent a boat and go to the river, but I don't know if that's possible on this kind of tours. Though Aix and the ceramics were interesting, I could have skipped them to have more time in the canyon and Moustiers. Overall the trip was good and Remy was a pleasant and professional guide, but there were a few problems. The main reason I booked this trip was because I wanted to visit the gorge and maybe go for a swim if time. However, due to the stop at the earthenware factory being far too long and several members of the group not meeting back on time, we had literally 10 minutes by the water. And then a 2 1/2 hour drive back. Our tour was wonderful, I would highly recommend it. Our guIde Emilie was wonderful, very helpful and full of interesting and knowledgeable information. Pleasure to spend the day with and it was fantastic to be able to visit so many places within the one day with comfortable stops in between. Highly recommend if not for Gorges Verdun alone. The long walk in the back streets of Aix en Provence to try a piece of calisson was not worth it. Cours Maribeau and Cezanne' studio would have been much more interesting. The rest of the trip was good . Emelie the driver was very good.